Thread: Wet seatbelt when raining. Hey guys. So it rained a few days recently and my car was fine until one day I got in my car and the seatbelt was soaking wet. Only the drivers side, everywhere else was fine. No water showed anywhere, just a wet seatbelt. So I took it into the dealer and they checked it out and said that all the drain lines had deteriorated. I'm surprised since it's not exposed to sun at all and don't see why it would completely deteriorate. They said the repair would be about $1,000 , which is better than a moldy car, but still a lot of money. So basically I've got my doubts about it being true, maybe it is, but my gut just doesn't feel quite right. 3. I showed up at 6:30am, a half hour before they opened so they had it since then, and I didn't hear anything from them til (when I called them) 4:40p.m. , why so long to find out the problem? 4. I recently had a bunch of work done on the car and brought all my own parts, so my service advisor never sells me any of the parts. He quoted me $155 on a part recently and said he couldn't go cheaper. I walked over to the parts desk and got it for $120. 5. He knows I'm very OCD about my car (literally everything looks like brand new) and I'd die if my interior got wet from leaking. So of course I'd rather pay $1,000 than have a water stained and moldy car. So maybe he thinks he can sucker me into a "fake" repair because of my OCD and the fact my car is literally like new? Something just feels off, it also seems like they keep having an excuse to keep me coming back, "oh that panel wasn't the right one, come back Tuesday" , "your seat panel was the wrong one, come back next week and we'll have it" , "oh your side step is missing bolts and needs to be welded because it's stripped" but was fine other than a minor misalignment that morning and now it bangs and rattles. Ya know, as I'm writing this, I'm thinking I should try a different dealer. Is there a way I can check the lines to see myself? Would like to get this figured out, expecting lots and lots of rain. First you need to either find another dealer or someone you trust if you can't do this or any other maintenance on your car. He is taking you for a ride! From what I just read, this guy is just plain untrustworthy. Next, although I'm not familiar with your car, you are correct, without taking aprt the car it's hard to make a blanket statement like he did, although I will say, IF they have seen this type of problem before maybe that's why he did, but then again if they've seen this type of problem before he would or should have told you " Yes we've seen this before and this is what it is" That's from experience, which is what they have from working on these cars. Now as far as your problem, where is the seatbelt wet? Upper portion, lower portion, back top, lower bottom? Have you felt around the floor, is any of the carpet wet? This includes under the seat? Did this happen the other night when we had our first rain of the season? If not take a hose and with the doors shut,(obviously) start running water all the the door seams and all around the door, not for a minute but for a good couple of minutes, sometimes a problem like this takes a while before it shows itself. I'm right down the block in Tracy CA, if need be shoot me a jingle and we'll try and figure this out and save you some money. but definitely dump that dealer. That does sound very fishy, unless you regularly flush the drains with battery acid. Which you likely do not. Myself and several others here have had the soaked interiors from the sunroof, and it turned out to be clogged drains and nothing more. It's not hard to at least verify that yourself if not repair. 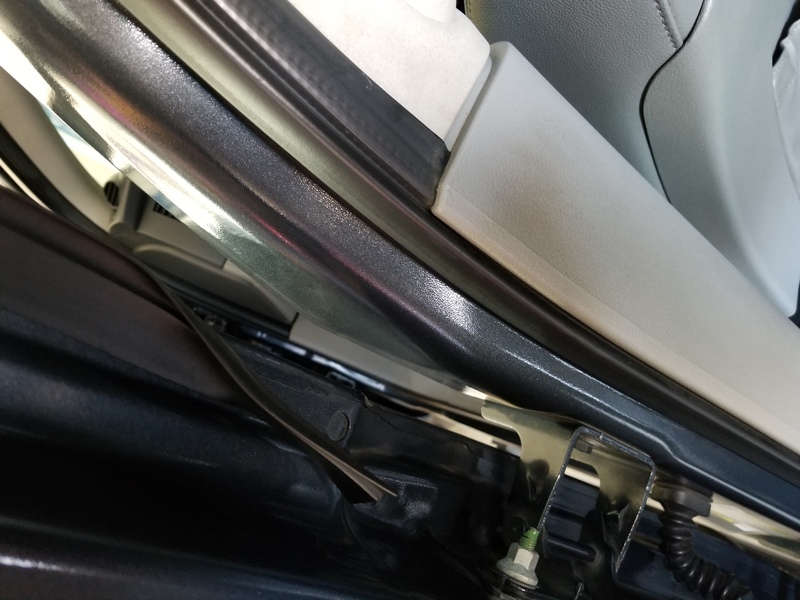 since the clog typically happens right at the drain ingress at the sunroof (which is what I assume you are talking about here, and not a door seal or something). I agree that the dealer is taking advantage of you from the sounds of it. I had a clogged drain a year ago. I could not believe how much water got in, even with the sunroof tightly closed. I had standing water on the passenger floorboard. Just one drain was clogged out of four, I couldn't believe the tsunami that ensued because of it. I'm not so sure I can trust this guy anymore, kinda annoying, I thought I could. Dealer location was extremely convenient too. When I dropped it off he said it should only be a loose connection, I asked if the lines go bad and he said that shouldn't ever happen. (Stupid me) I said if they had worn out though or needed replacing to let me know as I don't want any leaking, he assured me again that shouldn't ever need to be done. Then later he did say he had seen nothing like it before but all the lines were deteriorated. So from what he said it's the first he's ever seen. So once again, how do they know without taking it all apart?? Also don't know if it's a problem, but noticed this trim piece lost its glue on the lower portion (see attached picture), just fixed it with 3M. I'll try running some water and see if I can find a leak. Though how does the pillar trim come off? Thanks for the offer, I'll let you know if I need help! I haven't found any water anywhere other than the seatbelt, so I don't think the drains are clogged at the opening, my guess is there's a sleeve that connects two pieces of the tube and it came loose lower down the line. I think you're on the right track, I can't tell you how to remove the lower trim pieces, my model is older and dfferent, I'm sure some one else will chime in. The offer is still there if you need it. I didn't realize it was just the seat belt wet where it spools behind the pillar. Like DDT says, I think you're on the right path. I'm sure it's happened plenty of times but this is the first time I've heard of a drain separating. Nothing surprises me anymore. If you can't see a screw, the trim probably pops off. I took it into a different Dodge Dealership this morning. They took a look at it and said the lines were draining fine and the only issue they found was the sunroof wasn't leveled properly. So they fixed it and said it should be fine now. Looking at the sunroof now, it does look more level and to have a better seal. So I should hopefully be all set now! Glad you got it figured out. Just stay away from your former Dodge dealer. Hey forgot to post back. So the sunroof wasn't the problem, still leaked. What I later noticed was the luggage rails were really loose on both sides, especially the drivers. There's a plastic tab on the roof that the front of them slide over to hold them down. There's a rubber gasket under the plastic tab, it was loose on both sides, especially the drivers side. It's right above the pillar and the hole goes right through the roof, so if water made it's way under it It'd most likely be the source of the leak. I removed both roof racks and cleaned the area out (lots of dirt and debris, really surprising), siliconed the gaskets on both sides and cleaned everything up (OCD) (clay barred and waxed) before putting the rack back on and screwing the screws in with some Thread Lock. 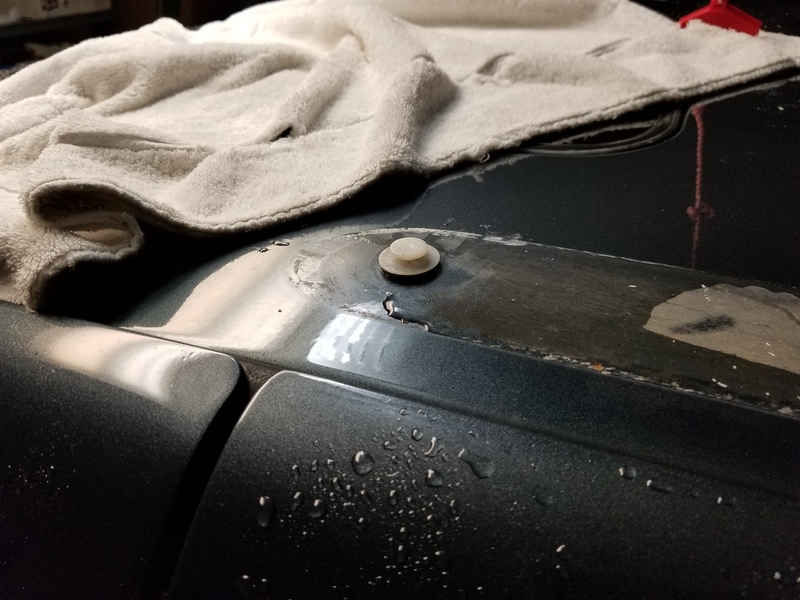 It's way more solid than it was before, let it dry for about 48 hours before I took the hose to it, ran the hose over the entire car (mainly the roof) and didn't notice any leaking. So it should be set now. Durangutan and Dadditruck like this. I am having the same issue. So you removed the rails and siliconed the gaskets? I will try that ASAP. I think we have similar OCD issues.